ouufff….tonight was a little tough. It’s called “Fight Gone Bad”. Why? Well….because an MMA athlete said that’s what it felt like afterward. For a look at the workout and to get the full explanation of the name check out this video. Our’s was slightly modified. We don’t have a rowing machine (which I love using…my favorite equipment at my other gym) so we replaced the rowing with a 200 meter run. The girls used an 8lb medicine ball and a 35# bar for the deadlifts and push presses. I also had to do step ups because I can’t do box jumps yet. Plus, we had a 2 minute rest. So…what was my score? 182 (doesn’t include any points for the run). Yes….it was tough and I’m pretty sure my arms are going to be hurting tomorrow and Saturday! 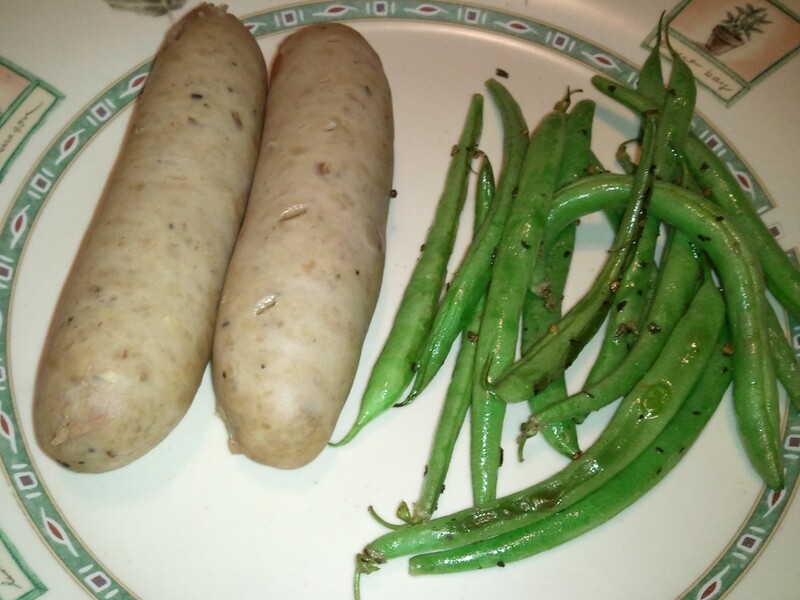 For dinner tonight, I had some nitrate free Fajita Chicken Sausage and roasted green beans. YUMMMM. The sausage was a little scary looking (very white) but it tasted great. I made myself eat the whole thing even though I’m hardly ever hungry after CrossFit. My total calorie count for today was 1341…much better than previous days! This entry was posted in Good Eats, Workout and tagged Box Jumps, Fight Gone Bad, JanGTD, Paleo, Push Press, Sumo Deadlift High Pull, Wall Balls on January 6, 2011 by Tammy.